This large heart shaped box is covered in a beautiful ivory or cream jacquard, yours to choose. It would perhaps make an amazing engagement or wedding box for the groom to give the bride, or the bride's parents. 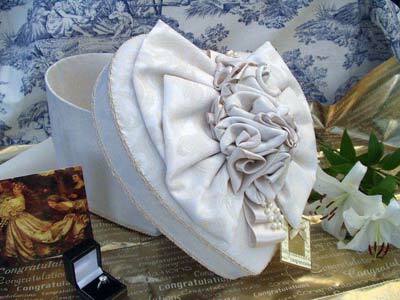 The softly padded lid is topped with ribbon and fabric roses.